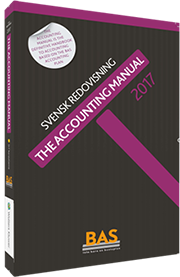 The Accounting Manual is based on the Swedish book for current recording of transactions (Bokföringsboken). In addition the English version includes references to laws and regulations that must be applied when preparing annual accounts. The Accounting Manual is produced by the BAS organisation, which has devoted almost 40 years to developing and maintaining the BAS Accounting Plan. All products in the Swedish Accounting series are sold by Wolters Kluwer.